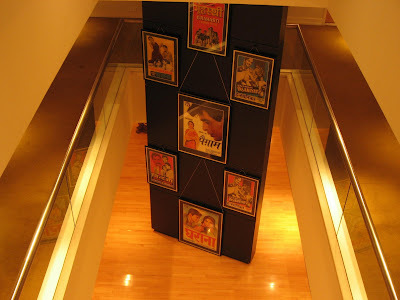 For nearly thirty years from 1940, the Gemini Studios of Madras (now Chennai) was one of the most influential film-producing studios of India. The Gemini emblem of two small boys with bugles adorned many a classic movie made between the 40s and the 60s. 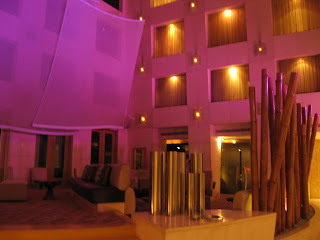 My hotel this time, The Park in Chennai, stands in the middle of where the studio once existed. 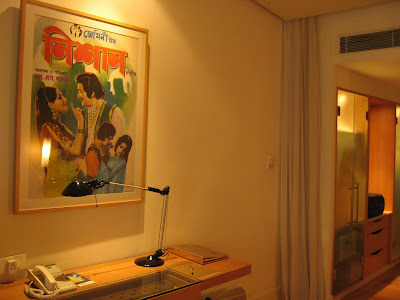 The Park brings back the magic of Indian Films in a rather interesting way: The corridors and rooms are decorated with original posters of movies made in these studios a long time back - in Tamil, Hindi and even Bengali. 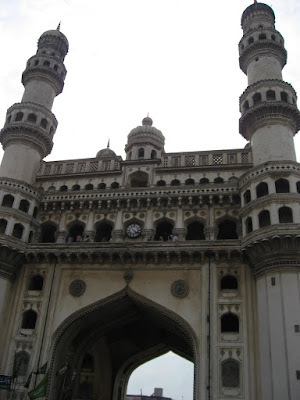 I had landed late in the evening on a Kingfisher flight from Pune. 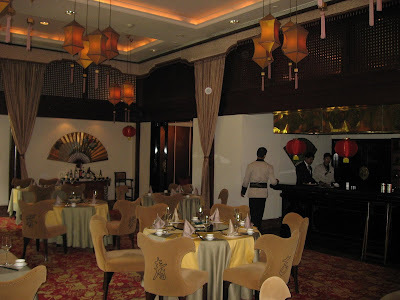 By the time I checked-in it there was only time to have a quick dinner before retiring for the busy day ahead. 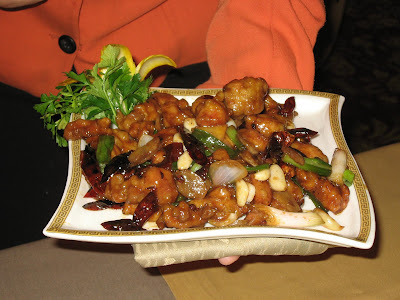 601, their all-day dining restaurant, serves buffets but I ordered some local dishes off their menu. The restaurant was quite busy but quiet - until a number of giggly-chatty Thai girls walked in, probably an airline crew letting their hair down. 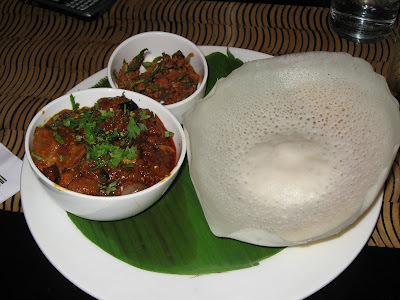 The mutton sukha varuval made in Chettinad style with shallots was hot and spicy and was a delight to have with the freshly made appams. They also served a side of crisply (batter) fried okra which was pretty interesting too. 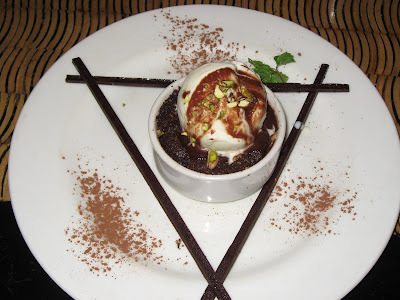 Then the waiter insisted I end with their chocolate brownie topped with ice-cream - apparently very popular here. 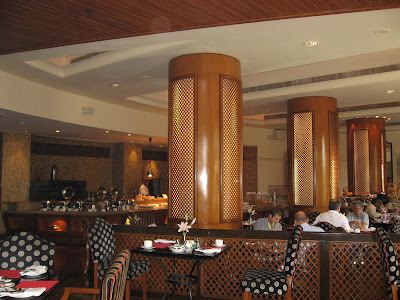 During the two days at Chennai, I tried the lunch buffet at Trident Hotel (excellent) and a dinner buffet at the Radisson (very good). 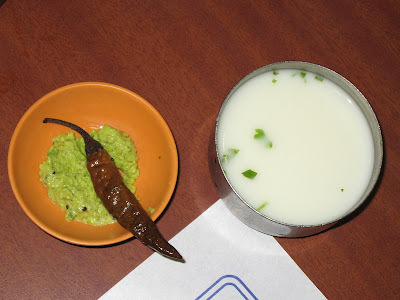 However, the highlight was clearly my lunch at Saravana Bhavan. A reader of this blog, Anu, first pointed me to this restaurant chain which now has outlets in Delhi, Dubai and even Silicon Valley. The eating area was crowded but they opened a new section for us. 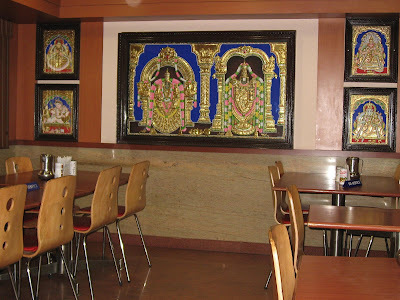 Pictures of Hindu Gods drawn in a South Indian style adorned the walls. 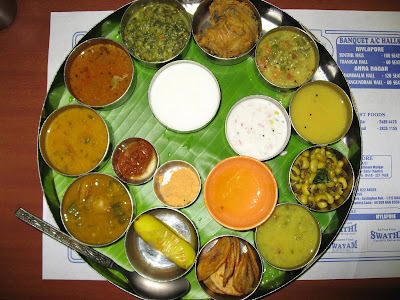 The South Indian thali I selected was very good (and filling too!). Unlimited (vegetarian) food for only Rs:150 (approx USD 3=00) per person; I don't think you can get better value for money than this! 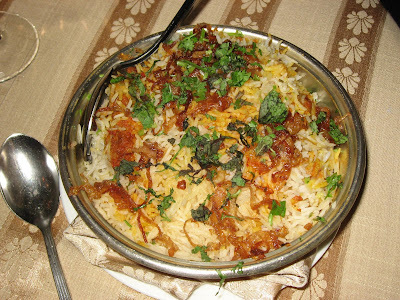 The food was very hot and spicy and contained a multitude of veggie preparations along with chutneys and spice mixtures to dip into. 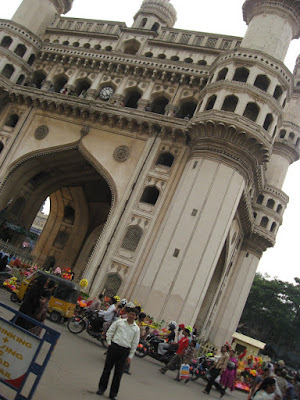 During this trip, I also discovered how expensive this city has become. Rents for apartments are almost double what they are in Pune; drivers, maids, and such help are more costly too. Water continues to be a problem even though the good rains in the recent past have helped. Every road is jam-packed with traffic - this I guess is happening everywhere (read Thomas Friedman's latest, Hot, Flat and Crowded; it makes some excellent points on where we are headed). 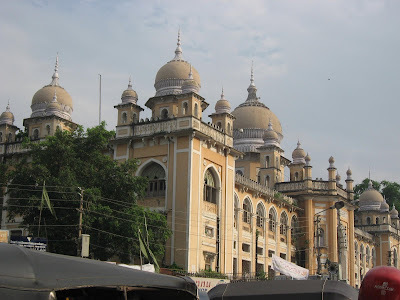 I left Chennai with large packets of Sambar powder, kai muruku and Mysore Pak - thank you Bala and Geetha! With this, flavors of Chennai will grace my dining room for some more time. 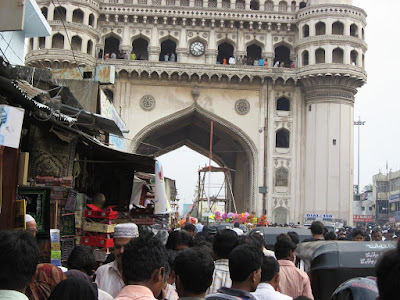 I have been making quite a few short trips within India recently. 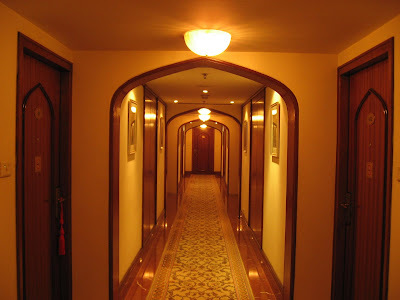 Between congested airports and busy meetings through rains, bad roads, and traffic jams, the hotel seems welcome and tranquil. 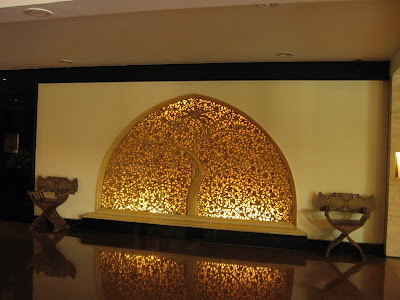 Indian business hotels are actually pretty good; with creative decor, multiple restaurants and great service, they are in many ways better than their counterparts in the US. Last week, I found myself on yet another flight, this time to New Delhi. Jet Airways seems to have lost its glamour to Kingfisher lately; while their flight crew continues to be good, their ground staff is no match to Kingfisher. Delhi's airport looks dated and badly managed when compared to those in Mumbai, Bangalore, Hyderabad and even Pune; however the roads here are as good as it can get in India. The trees lining the road in Delhi were lush green now, thanks to the recent rains. I made a detour to Haldiram's, that temple of all things sweet and savoury. A little while later I checked into my hotel, The Oberoi, armed with boxes of petha, gujiya, moong dal burfi, and variety of kalakand. I ran into Wasim Akram at the check-in counter; he was here to coach a boy's team. To my annoyance, I couldn't locate my camera which was locked in my suitcase! 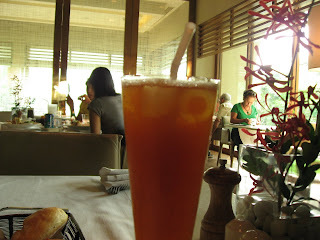 It was quite late in the afternoon when I walked into Three-sixty, their all-day dining restaurant, for lunch. 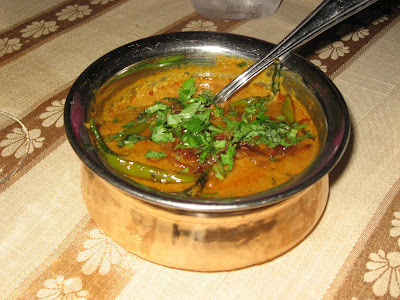 The Rogan Josh, a Kashmiri dish made of mutton in a fiery red sauce, was excellent. 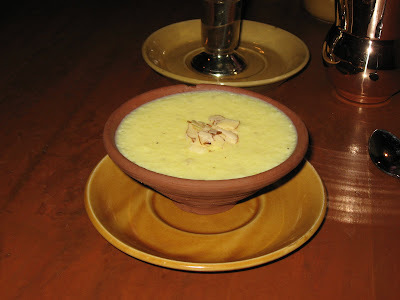 This was accompanied by home-style phulka roti - extremely rare in restaurants, moong dal and masala aloo. 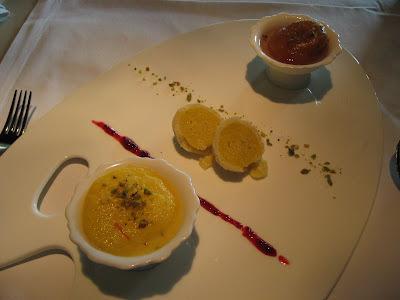 The dessert sampler included a portion of chenna jalebi, rasmalai, and kheer kadam. 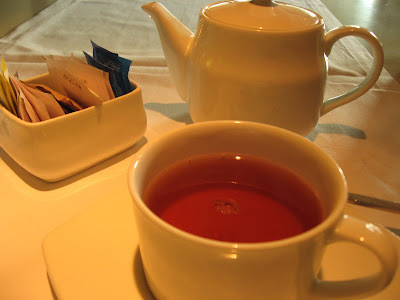 The Oberoi blend tea provided a refreshing ending. 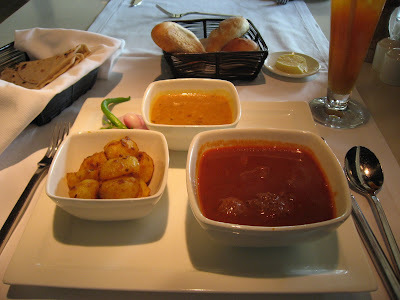 The Oberois never cease to amaze me, and this lunch was another example of why they are considered India's premier hotel and resort chain. In the evening, I headed towards Delhi's diplomatic district. 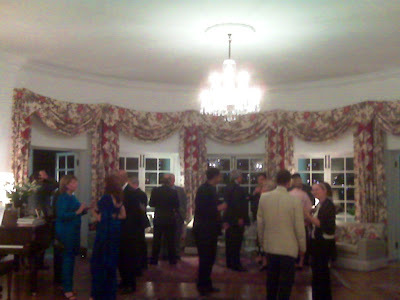 I was here to attend a dinner at the British High Commissioner's residence. The majestic Rashtrapati Bhavan, residence of the President of India, and the Parliament building looked imposing in the fading sunlight. My first close encounter with the diplomatic corps was interesting, but wearing a suit in the hot - and unusually humid - evening wasn't fun. There were a bunch of industry leaders and diplomats along with some media and university representatives. 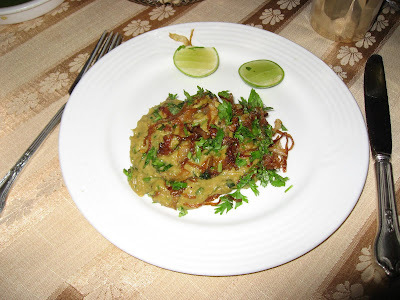 During the dinner buffet I remember Coronation Chicken, Rice Salad, tomato & basil, and baked calcutta bhetki with herbs. I was up early to catch my flight back. 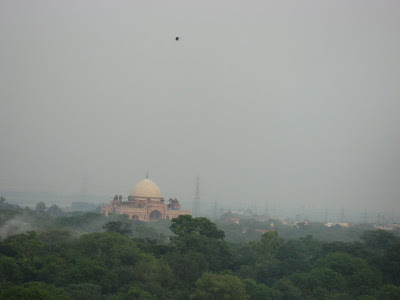 From my hotel window I could see the dome of Safdarjung's tomb rising through the morning mist - a reminder of Delhi's long and rich history as the capital of many powerful kings and empires. At the airport I ran into Javed Akhtar and Shabana Azmi - he in his simple kurta and she in a pantsuit; they are quite a couple! 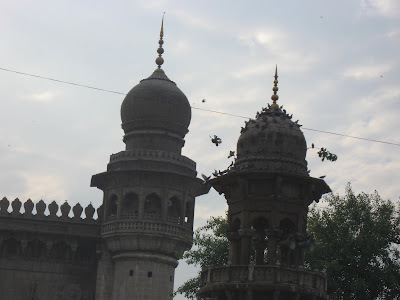 Just a few days earlier I was in Bangalore. I flew Kingfisher this time and again noticed how good their ground staff and guest relations people were. The low visibility due to a foggy morning in Pune caused a 30 minute delay but the traffic in Bangalore was kinder to me. 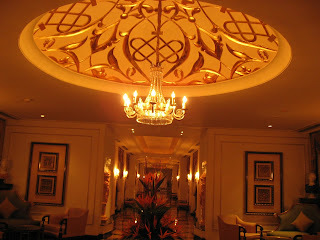 I was in the Oberoi within an hour from landing. It was a busy day, and I grabbed a quick working lunch at Le Jardin, their lobby-level coffee shop. BTW, the kathi rolls at Pune's Sun N Sand is way better than the one I had here (yes, yes, I agree Kapila Kathi Kababs on Dhole Patil Road are better than both!). 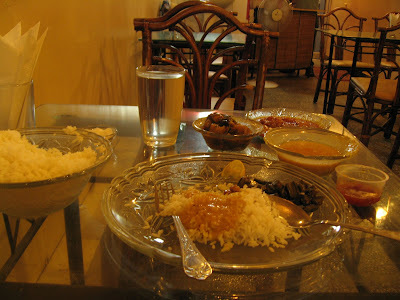 For dinner I tried to locate 36 Chowringhee Lane, which some people told me is the place of choice for good Bengali cuisine. While Google pointed me to a wrong address, I found the restaurant at its new location on BTM Layout, 100 ft road opp the Indian Oil petrol pump. 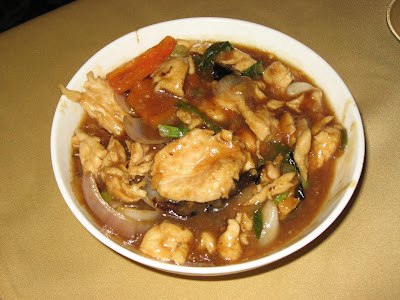 The restaurant is little more than a hole-in-the-wall, but the food was good and very affordable. Rewind some more. 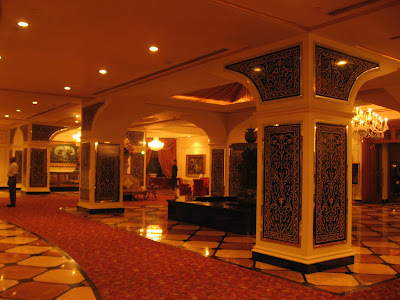 During my trip to the US, I stayed at the Grand Maratha in Mumbai and dined at the Peshawar - one of its many wonderful in-house speciality restaurants. 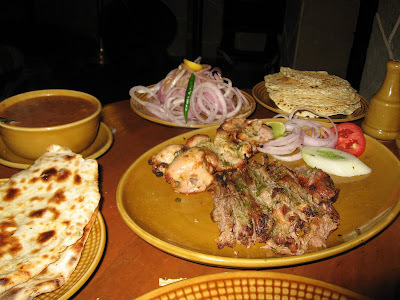 Here are pictures of the excellent kabab platter with their signature dal and phirni for dessert. 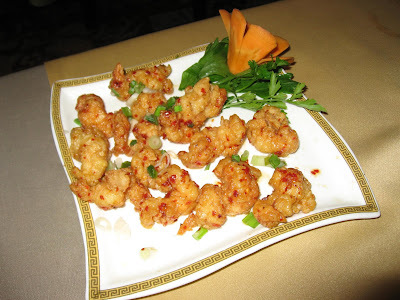 If you are on your way to the airport, this hotel has some of the best restaurants this side of town. 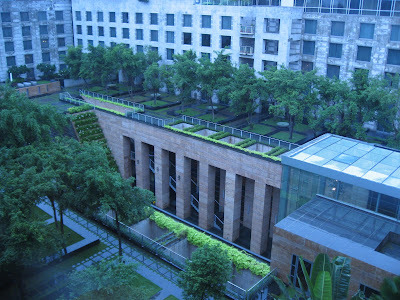 The Grand Hyatt, another large Mumbai hotel, has an interesting garden built on top of their large lobby and atrium. Here's a picture I took on a rainy morning from my hotel room before checking out to catch my flight back to Pune. 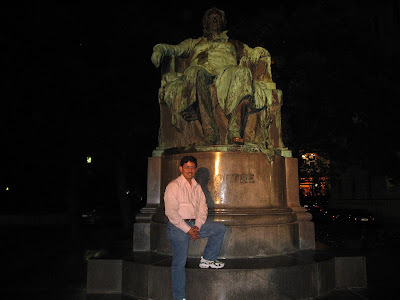 I just realized this blog completed two years. 200+ posts in these two years and over 6000 of you visit here every month. Thank you, especially my regular readers, who have been a great source of inspiration! 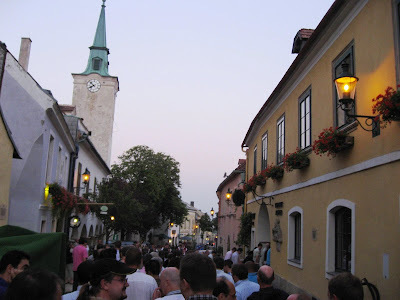 For years, taverns called Heurigans have existed in Austria's wine country. During the early days, people carried their own food to these places; now they all offer a mix of food and entertainment along with the wine. 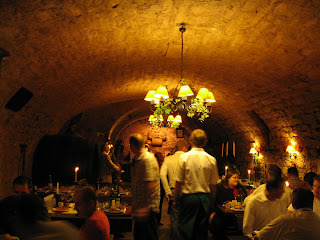 I visited Benediktinerhof - one of the oldest wine estates in Vienna Woods, just outside the city. The undulating hilly countryside, the vineyards in the distance, the old church tower and the village made for a lovely sight in the fading sunlight. The wine tradition of Vienna began during Roman rule; at that time wine was made only for consumption by the nobles. The common man could not grow grapes for money. That changed only after a Austrian emperor enacted a law much later. About 80% of wine produced here is white. 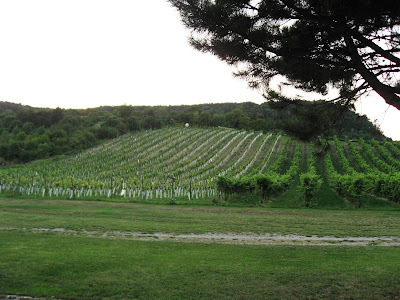 Sweet grapes grow on the slopes that face the South. 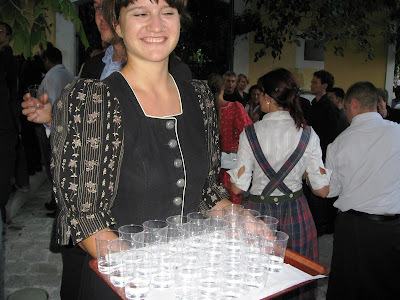 We were welcomed by girls in traditional costumes, with shot-glasses of schnapps, as a band played folk music. 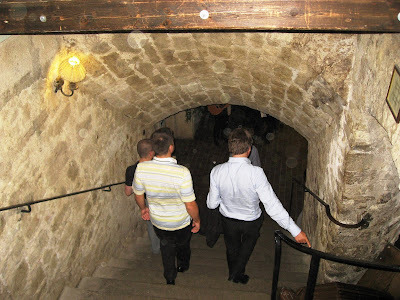 After a while, we trooped into huge underground wine cellars of the tavern to sit around rough-hewn tables that were loaded with food and wine. Candles flickered throwing shadows on the walls. The Heurigan was much larger than I had initially imagined; they have enough space in their underground taverns to seat 800 people! Bottles of wine, breads, herbed cheese spreads, beef Carpaccio, and other starters kept us going for a while. Conversation flowed freely as did the wine and beer. Entrée was simple meat and potatoes: fried chicken, pork, and other meats. For dessert we had the omnipresent Apple Strudel. I had three Israeli colleagues at my table and one from the USA, and the hours went by fast. All this while, a few elderly musicians entertained us with local folk music. 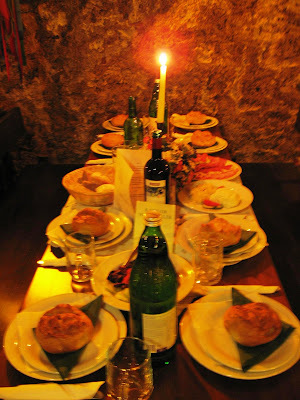 Heurigans have never been sophisticated dining or drinking spots; neither the wine of the food were top-notch. 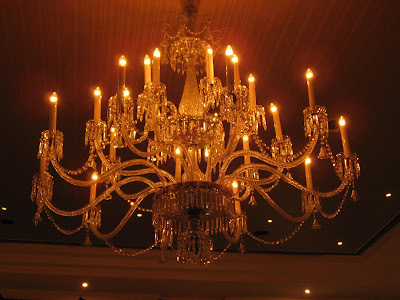 However, the place did have a lot of atmosphere and we had a very enjoyable evening. 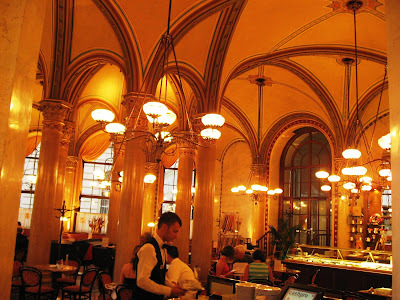 The other must-visit place in Vienna is one of their famous coffee-houses. Interestingly coffee came to Vienna when retreating Turkish invaders left behind sacks of coffee beans. Since then, Vienna has developed a sophisticated coffee culture where it is blasphemy to order 'ordinary coffee'; instead you order from one of many choices on every menu here. Even my Austrian Air flight had a coffee menu. Among the many coffee-houses I walked into, one deserves a special mention. Café Central is one of the many historical cafes that still abound. 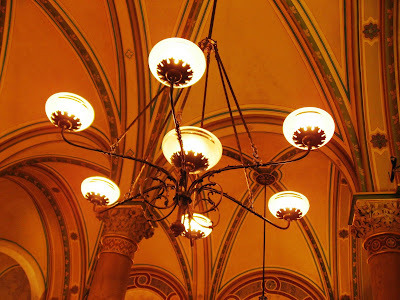 The interior is quite amazing with arches, vaulted ceilings, and old-fashioning lighting fixtures. 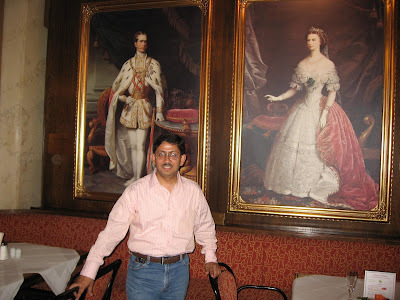 We sat under large portraits of Austrian royalty; yes the regal-looking lady in the painting behind me is Sisi, the tragic queen of Austria I wrote about earlier. 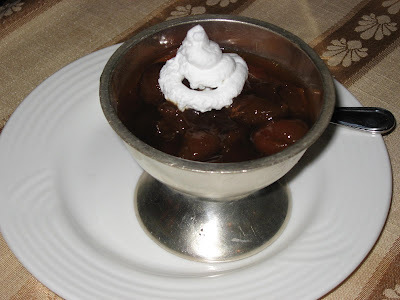 The cafe also serves up delicious local favourites and desserts. 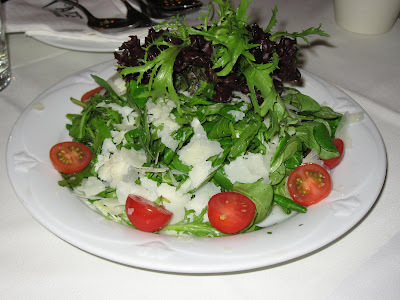 Here is an interesting salad I had, called the Rocket-Lamb's Lettuce Salad with Tomatoes, Olive Pesto and Parmesian Cheese Shavings. 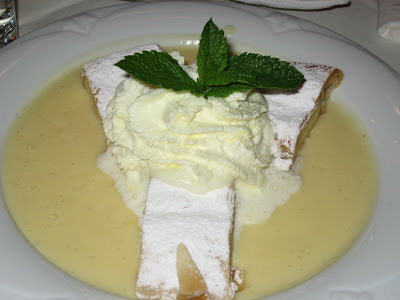 The dessert in the picture is a Cream Strudel with Vanilla Sauce. 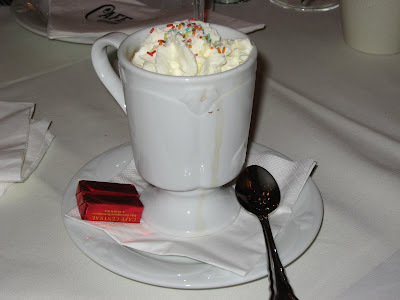 The coffee with apricot liqueur was particularly good. 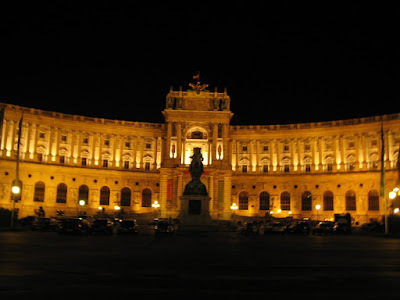 After that dinner, we walked through the Hofburg Palace, which was lit up now and looked very nice against the night sky. 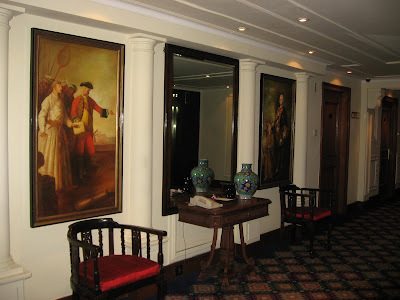 We passed by the Museum Quarters, the Opera House - the best in Europe, or so claimed my companions, and Gothe’s statue. During one of my early jobs, all new employees used to be given a Commitment plaque that left a lasting impression on me. I still have it in my study and it quoted Goethe: "Whatever you can do, or dream you can, begin it. Boldness has genius, power, and magic in it." 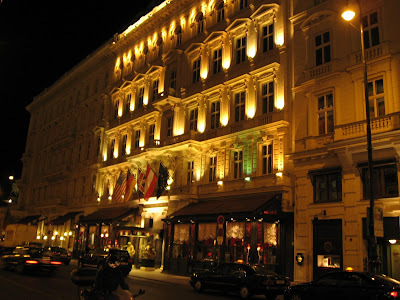 We took a detour to the elegant Sacher Hotel, home of the world-famous Sachertorte. Made of two layers of dense chocolate cake, this torte has a layer of apricot jam in the middle and dark chocolate frosting on all sides. 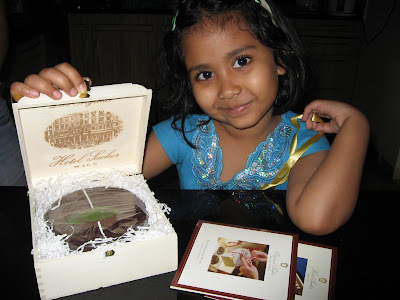 I picked up one for my family; the torte came packed in a wooden box engraved with a picture of the Sachar Hotel. Here are some pictures of the torte after it was opened at home in Pune. 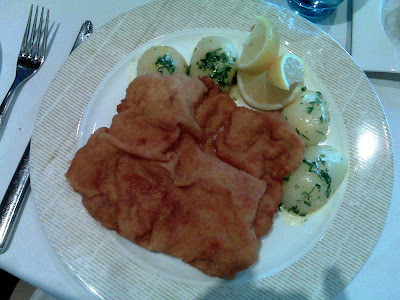 And finally, the Wiener Schnitzel! It was huge, tasty, but too filling to eat often. Also, as you can see, it's not very photogenic.